1897 – The park was formerly opened on the occasion of Queen Victoria’s Jubilee on 17th July, by Thomas Shann. 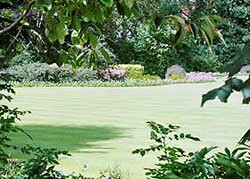 The first bowling green, formal gardens and a bandstand were constructed during the years 1897-1910. 1930s – In 'The Path to Healthy and happy Homes', a guide to Manchester and district, Heaton Moor was described as 'one of the very best residential suburbs', 'ideal surroundings with pure fresh air, with many open spaces, delightful parks and recreation grounds, in which there are facilities for very outdoor game and amusement'.